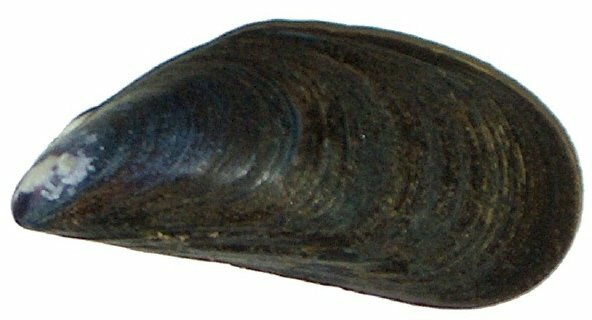 This is about the bivalve mollusk, blue mussel Mytilus edulis. They are cultivated as aquaculture. The pictures of these mollusks, with the Latin name Mytilus edulis, are given below. New research discovered a new threat to marine mussels. 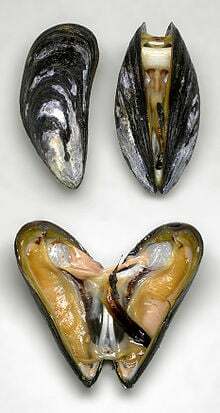 It was found [2-7] that the mussels decreased their water filtration rate under the effect of some synthetic chemicals that pollute seawater. The name of these organic chemicals is surfactants (surface active substances, surface active agents). The surfactants are the key foam-forming component of detergents and shampoos. More about the effects of surfactants see in the blogs , and in the scientific papers [2 – 7 ]. This post is the forth one, to continue the series of posts on environmental and ecological issues [1-3]. A legend grew up that there was a lady Molly, who lived in the 17th century. In some books, she is represented as a hawker by day and part-time prostitute by night . In 1988 the Dublin Millennium Commission endorsed claims concerning a Molly Malone who died on 13 June 1699, and proclaimed 13 June to be “Molly Malone day” . The Molly Malone statue in Grafton Street (Dublin) was unveiled by Lord Mayor of Dublin, Alderman Ben Briscoe during the 1988 Dublin Millennium celebrations, declaring 13 June as Molly Malone Day. This poem and song became really important. 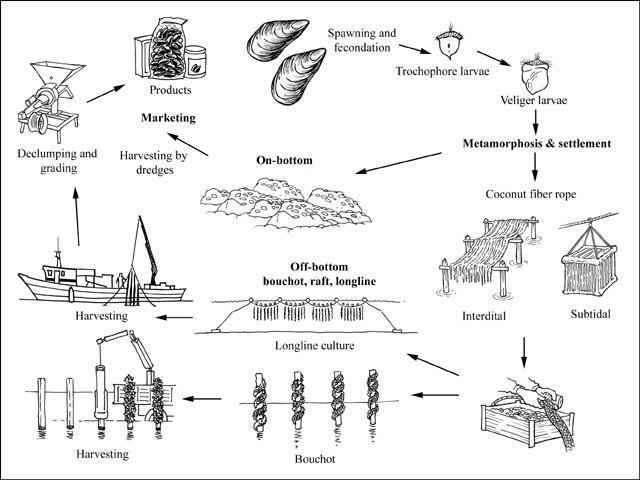 Therefore, conservation and survival of this species of bivalve mollusks is important from various perspectives: not only for reasons of food but also for reasons of cultural heritage. Siobhán Marie Kilfeather, Dublin: a cultural history, Oxford University Press US, 2005, p. 6. Environment, Water and Ecology. Environmental role of synthetic surfactants. In the previous parts of this series of the material posted, it was explained why it is so important to analyze the issues of aquatic environment, water quality, and related issues of how chemicals interact with aquatic organisms (see Part 1, ). Also, it was shown that aquatic organisms contribute a lot to improving water quality, as exemplified by the organisms that are filter-feeders (Part 2, ). In this material (which is item 3 to continue the series of previous posts on Environment, Water and Ecology [1, 2]), the goal is to consider additional eye-opening information on chemical pollutants of water, especially on the chemicals that until recently were considered as relatively safe, namely, synthetic surfactants. These chemicals – surfactants – are components of many industrial products of broad use: laundry detergents, shampoo, liquid soap, dish washing liquid detergents, cosmetics, car cosmetics, pipe washing mixtures (including pipes of various use, e.g., pipes for milk and pipes for gasoline), liquids for fire extinguishers, and even pesticide mixtures of broad use in agriculture, horticulture, and in making lawns and playing grounds for golf to look nice. These chemicals are known under various names: surfactants, detergents, tensides, surface-active substances, surface active agents. Quantity. Discharge that pollutes the environment. The daily discharge of surfactants to waste waters is more than 10 g per an average inhabitant of urbanized areas, which means a discharge of 10 thousand kilogram in a city of 1 million people, which is equal to 22 thousand pound every day or more than 6 million pound annually! The point is that recent research [3 – 5] demonstrated that it was a wrong opinion. A key issue is the issue of criteria to use for assessment of the environmental hazards of chemicals. Recently, a development of new criteria was made . These criteria gave attention not only to easily visible lethal effects of chemicals (increase in mortality of the organisms tested in the experiments) but also to less noticeable sublethal effects (which decrease functional performance of the organisms and finally their health). Moreover, more attention was given to the ecosystem health. New experiments showed a variety of negative effects of surfactants on bacteria and cyanobacteria, algae, higher plants and invertebrates, including mussels and oysters that are key organisms that are being grown in aquaculture [3-5]. The results on the new approach, and new experiments, were presented in a series of papers [4 ] and the book [5 ]. The results demonstrated that the synthetic surfactants pose a more serious hazard to environment, especially water environment [3 – 5], than it was previously thought. This is the book , in which a large amount of innovative results of bioassay of synthetic surfactants and detergents is presented. As it was mentioned, the experiments discovered many negative effects of these chemicals on bacteria and cyanobacteria, algae, higher plants and aquatic invertebrates. As a matter of fact, the discovery is: a new hazard to environment, a new priority in preventing negative effects of chemical pollution, in prevention of deterioration of water quality. The book mentioned and the related papers were cited by scientists of a number of countries as diverse as U.S.A., Germany, U.K., Denmark, Belgium, Netherlands, Austria, Spain, Turkey, China, Slovakia, and Argentina (in arbitrary order) . This research was carried out at Moscow State University (Russia), Plymouth Marine Laboratory (U.K.), University of New York (U.S.A.), University of Maryland (U.S.A.), and the Institute of Biology of Southern Seas (Crimea, Ukraine). A concise summary was presented in . Foam and surfactants: a contrasting variety of connotations, including Venus, or Aphrodite. According to legends of the ancient Greek mythology, a foam produced by sea water was a place of birth of the goddess of love, Aphrodite (Venus in mythology of ancient Rome). Love (to Simonetta Vespucci, nicknamed la bella Simonetta) and the legend on Venus inspired a genius painter of Renaissance, Alessandro di Mariano di Vanni Filipepi, better known as Sandro Botticelli (c. 1445 – 1510), to create one of the most charming images of the cultural heritage of mankind: The Birth of Venus (in Italian: Nascita di Venere; 1486). However, the research project and the book that summarized its results and was mentioned above added some less charming connotations to another type of foam, namely the foam produced by synthetic surfactants. Location of this post in the series of posts. Will wars of future be related to modern science and theories of ecology? Key issues, water quality: scientific fundamentals, achievements, discoveries, bibliography. 3. How broad is the spectrum of negative biological effects produced by surfactants and detergents? The Answer given by the book: it is really broad and covers all the organisms that were used in author’s bioassays, without any exception: from prokaryotes to eukaryotes, from unicellular to multicellular organisms, from bacteria to plants and animals. 4. Do sublethal concentrations of surfactants and detergents pose a serious hazard to the biosphere? The Answer given by the book: Yes, they do. A good example is the author’s discovery of sublethal effects of surfactants on bivalve mollusks, which lead to a decrease in filtration rate, which in turn leads to a decrease in water self-purification, which pose a serious hazard of a decrease in water quality. 5. Is it possible to offer any new efficient methods or new modifications of the current methods for bioassay of chemicals? The Answer given by the book: Yes, it is not only possible but implemented. The book contains new methods/modifications of methods which increase the efficiency of bioassay with seedlings of plants and activity of filter-feeders (Chapter 2 in the book). 6. In which countries was the book cited and proved to be useful? Answer: Belgium, Denmark, Austria, United Kingdom, Germany, Netherlands, Argentina, Saudi Arabia, Peru, Slovakia, and others. See the text below. Previously, the hazards from detergents and synthetic surfactants were underestimated. The new facts open our eyes to better see the new hazards to the environment and water quality. http://www.scribd.com/doc/52630298/FAQ2-Book-Bioeff-Surf-Part-2-Eng; Mutagenesis, Volume22, Issue 6, p. 363-370. Benzalkonium chloride (BAC) and dimethyldioctadecyl-ammonium bromide (DDAB), two common quaternary ammonium compounds, cause genotoxic effects in mammalian and plant cells at environmentally relevant concentrations. M.B. Yagci, S. Bolca, J.P.A. Heuts, W. Ming, G. de With. Self-stratifying antimicrobial polyurethane coatings. – Progress in Organic Coatings. 2011. In press; doi:10.1016/j.porgcoat.2011.04.021. Nanosized Photocatalysts in Environmental Remediation. Copyright © 2010 Wiley-VCH Verlag GmbH & Co. KGaA. Wilcoxon, J. P. and Abrams, B. L. 2010. Nanosized Photocatalysts in Environmental Remediation. Nanotechnology. 51–124. Caryn C. Vaughn, S. Jerrine Nichols, Daniel E. Spooner. Which libraries and institutions worldwide have acquired this book? Understanding the role of aquatic biota in forming water quality, and the impact of pollution and chemical substances that enter aquatic ecosystems is crucial to the assessment, prevention, and remediation of damaged environments. The book “Biological Effects of Surfactants” SYNTHESIZES THE MOST IMPORTANT FINDINGS from hundreds of articles and the author’s current experiments. His articles were on the biological effects of synthetic surfactants and detergents on individual organisms, populations, communities, and ecosystems. This book offers a new perspective of the hazards of pollution. The book DRAWS UPON NEW CONCEPTS IN AQUATIC ECOLOGY, hydrobiology, biogeochemical cycling, and the assimilative capacity of water. The analysis is made beyond the self-purification capabilities of bacteria and nutrient cycling. The book presents and examines a lot of new effects of anionic, non-ionic, and cationic surfactants as well as detergent mixtures on a wide range of organisms. The list of the organisms includes bacteria, cyanobacteria, flagellates, algae, higher plants, and invertebrates. The author is a distinguished member of the Russian Academy of Natural Sciences. He establishes new quantitative characteristics of the effects and presents study results reflecting newly discovered phenomena. The author is proposing and substantiating new priorities and approaches for testing, assessing, and characterizing the biological activities and hazards of chemical substances. Moreover, he illustrates how the data obtained can be used to develop effective environmental remediation and protection measures to improve water quality. The book ‘Biological Effects of Surfactants’ LAYS AN EXCELLENT FOUNDATION FOR SCIENTISTS TO EXPLORE HOW HAZARDOUS WASTES are absorbed in aquatic and terrestrial ecosystems. The book determines what is required for remediation and restoring water quality in freshwater and marine water bodies and ecosystems. In addition, the book designs the best approach to counteract the toxic effects of manmade surfactants using biological methods, including phytoremediation (phytotechnology). The book is a useful contribution to water sustainability, to sustainable development.